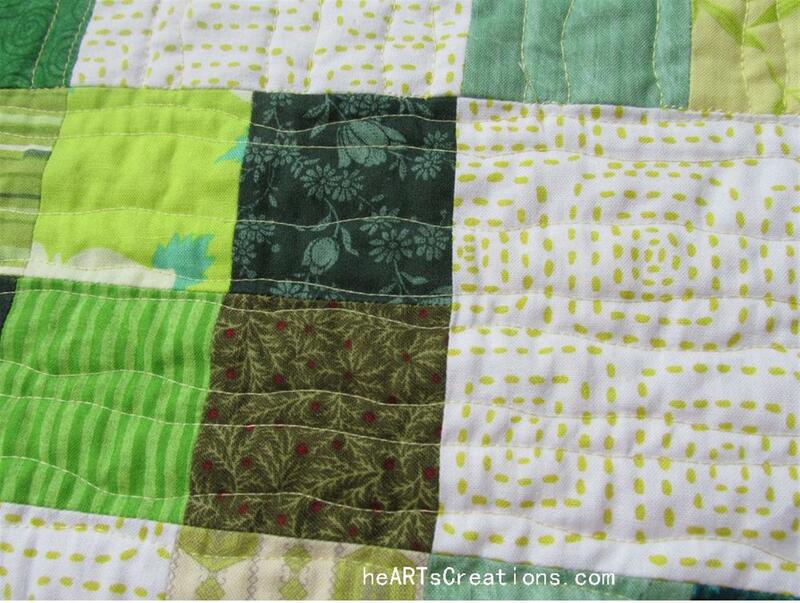 Finally – I quilted and bound my leader-ender green scrappy quilt, “Meadow.” I wanted to practice using my BSR (Bernina Stitch Regulator) so I quilted this one myself. I began by quilting it rather close and continued that pattern – it was a lot of quilting! I’m not giving any close-up shots of this one. Doesn’t matter really – it served its purpose. I put a lot of hours into it and am ready to move on to something else with my quilting. I prefer to keep it small though. No matter what I do to the surface of my sewing surface, it does not slide nicely. And, I don’t really want to quilt big quilts. 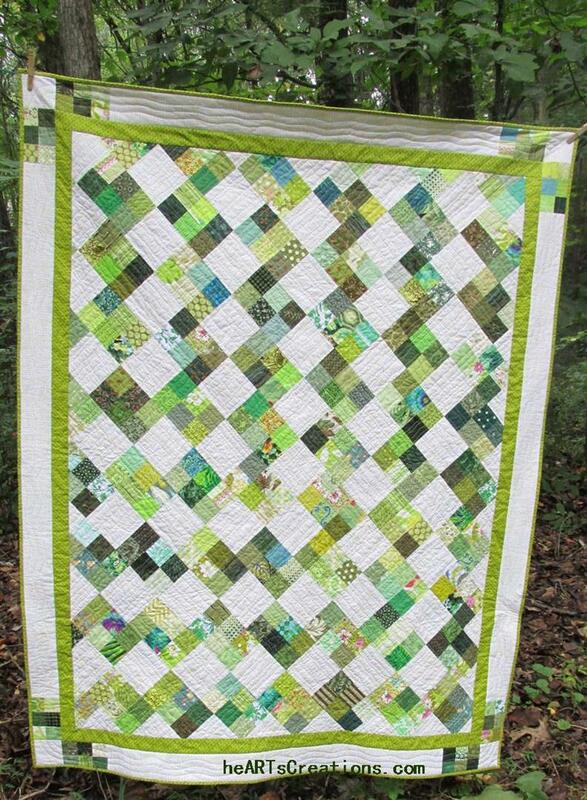 I love the soothing green of this quilt. It will be my “travel” quilt – cozy in the car and extra warmth when going to weekend sew-ins. 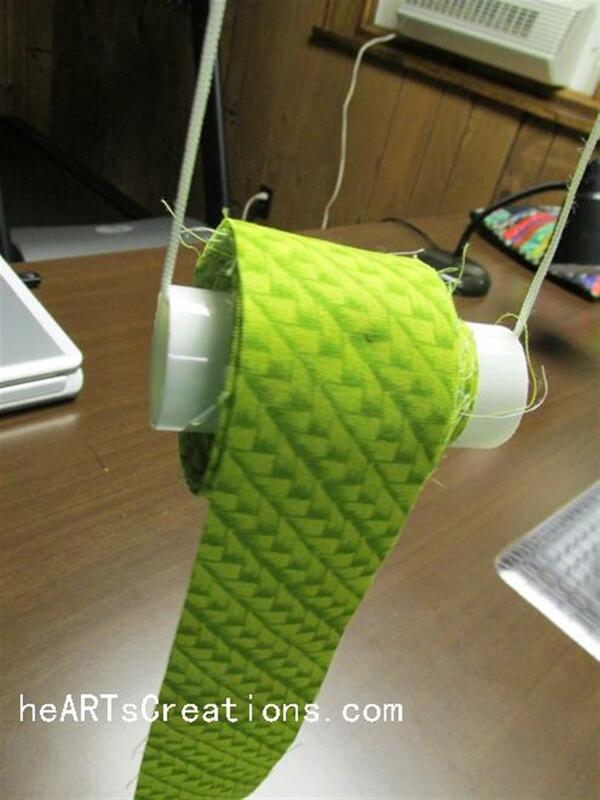 BINDING HOW-TO – I’m taking this opportunity to share how I have been doing my bindings. I am no longer able to hand stitch the second sides of my bindings unless it is a small wall hanging or art quilt. Unfortunately, my hand cramps. 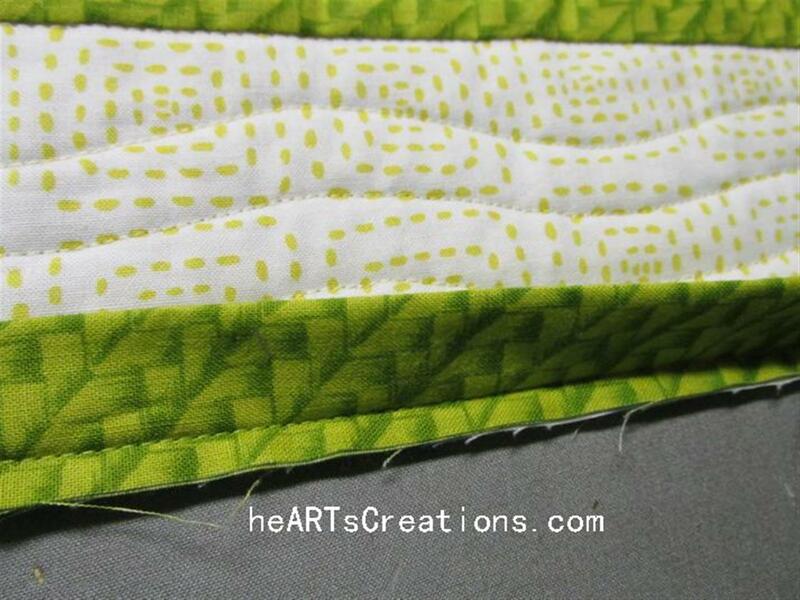 I’ve taken tips and pieces from several other quilters and have come up with my method. I prepare my binding but do not fold it in half. I put it on a handy roll that my hubby and I came up with. It goes around my neck and the binding never tangles or gets in the way. I love this gadget! I have several of the tubes, so as soon as I complete a quilt top, I prepare the binding and roll it onto the tube. 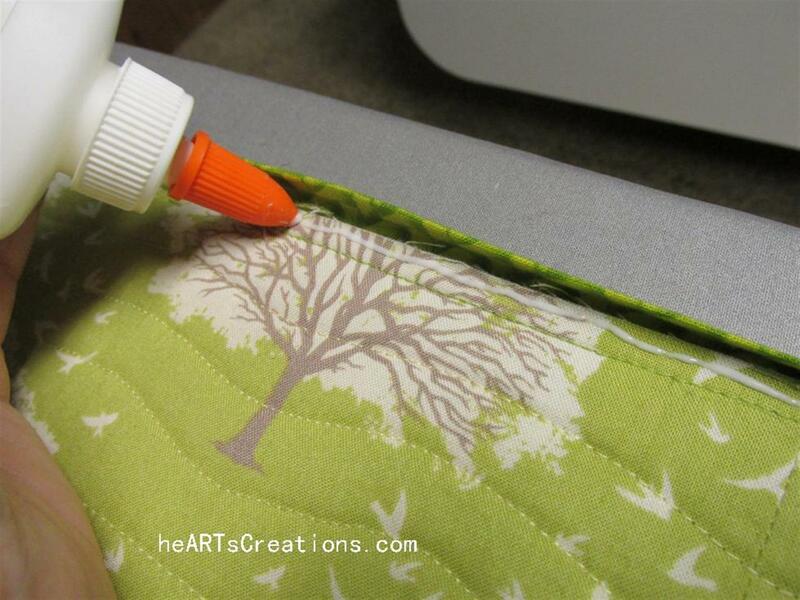 Sew the binding onto the right side of the quilt, mitering the corners and joining the ends. 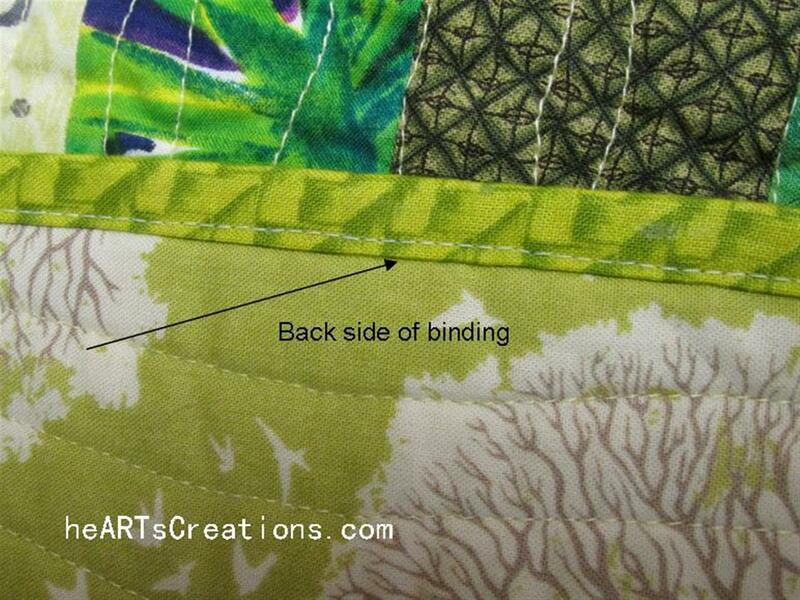 On the front of the quilt, press the binding open, flat. Turn the quilt over. Doing one side at a time, first turn the binding over to the back side of the quilt and press down. Then apply a very thin line of Elmer’s White School Glue (have never tried another glue and I understand this is the only one to use!). Press the binding down. 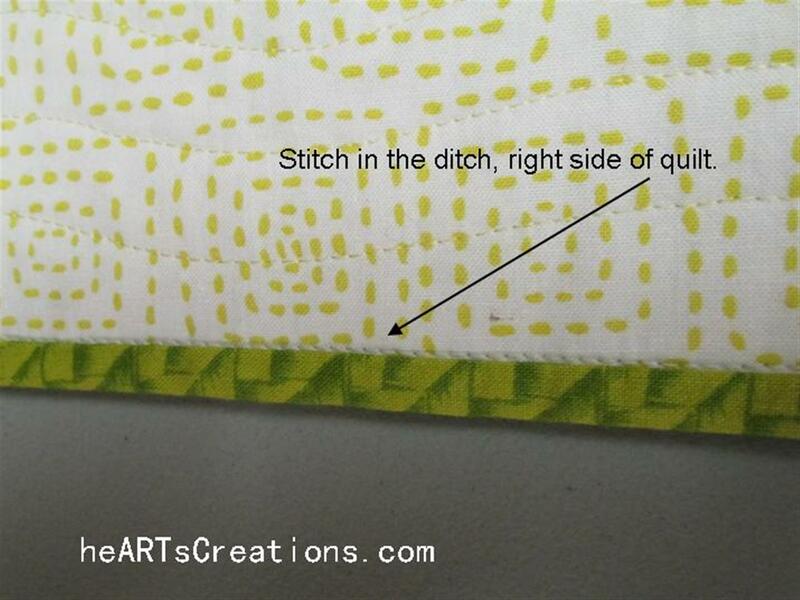 On the right side of the quilt, stitch in the ditch at the binding and quilt edge. It will catch on the back. Repeat for the other 3 sides.Take a couple of hand stitches on each turned corner. You’re done! A quilt binding done in a fraction of the time it takes to hand sew. The added benefit is that it will last forever – especially good for baby and kid quilts! 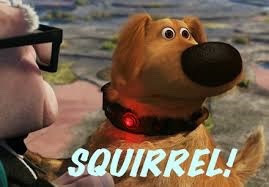 None of my other projects are even close to being complete. This is the first time in a long time this has been the case. Guess I need to get busy!! Posted in Color, Fabric, Pattern, Projects, Quilting, Scraps, Sewing Tools, Tips and tagged Binding, Fabric, Machine Quilting, projects. Bookmark the permalink.